Charles-Louis Morand Métivier is a native of France. His research focuses on the literary representation of the extreme emotions begotten by medieval and renaissance massacres, and on how these emotions helped create an idea of the nascent French nation as an emotional community, transcending the traditional ideas of nation building. He has secondary interests in literary and gender theory, early-modern poetry and theater, and in the expression of French popular culture through cinema, television, music, graphic novels, etc. He is the coordinator of "La Maison Française" and enjoys helping students discover and understand the many sides of French culture. He has taught classes on language, culture, translation, and literature. He has published articles and chapters on Ronsard and du Bellay, Christine de Pizan, and Philippe de Mézières, and Alain Chartier. 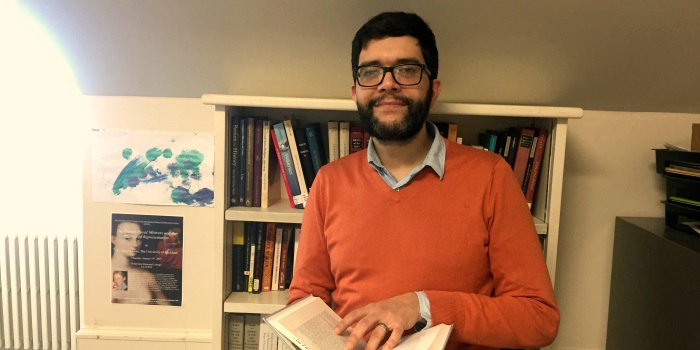 He is working on a critical edition and translation in prose of the Tragédie du sac de Cabrières for the Arizona Center for Medieval and Renaissance Studies, and is working on a book on emotions, literature and nation in the reign of Charles VI. La Tragédie du sac de Cabrières. Dramatizing and Interpreting History. A Critical Edition and Translation in Prose. Under contract with The Arizona Center for Medieval and Renaissance Studies. Affective and Emotional Economies in Medieval and Early Modern Europe. Edited with Andreea Marculescu, University of Oklahoma. Palgrave Macmillan, 2018. “Creation and Union through Death and Massacre: the Crusade of Nicopolis and Philippe de Mézières’ Epistre lamentable et consolatoire,” in Trauma in Medieval Society, ed. Wendy Turner and Christina Lee. Under Contract with Brill. “ « D’un vers non fabuleux je veux chanter sa gloire » : famille royale et émotions dans la poésie encomiastique de Joachim du Bellay,” Cincinnati Romance Review 38 (Fall 2014), 20-36. “Transfiguring the love debate: women as a national emotional community in Alain Chartier’s Livre des quatre dames,” under review at Mediaevalia. Passionate Words: Emotional and Affective Narratives in pre-Modern Europe (tentative title), collaborative volume, edited with Andreea Marculescu (University of California- Irvine). Encyclopedia entries on “Michel Sardou” and “Carlos” for Je chante donc je suis’: an anthology of French and Francophone singers, from Abd al Malik to Zazie (working title), forthcoming 2015. The Ramon and Marguerite Guthrie Fund at Dartmouth College, awarded for the organization of "Prosecuting War in the Long Fourteenth Century," with Andrea Tarnowski (Dartmouth College). Burack Distinguished Lecture Series, awarded for Renate Blumenfeld-Kosinski, University of Vermont, October 2014. Andrew Mellon Predoctoral Fellowship, University of Pittsburgh, Academic Year 2012-2013. Teaching Fellowship, University of Pittsburgh, August 2007-April 2012. Arts and Sciences Summer Research Fellowship, University of Pittsburgh, Summer 2011. Arts and Sciences Summer Research Fellowship, University of Pittsburgh, Summer 2010. Newberry Library Graduate Student Conference Travel Grant, Newberry Library, Chicago, IL, January 2010. Arts and Sciences Summer Research Fellowship, University of Pittsburgh, Summer 2009. Katz Business School Fellowship, Teaching of Business French, University of Pittsburgh, Summer 2008. French Medieval and Renaissance Studies; history of emotions.